Gavin, the 2009 and 2012 graphs don’t appear to have been corrected yet. On the graph you have shown for this post, why isn’t the model extended like the other graphs show? Thanks for the update and your help clarifying this issue, Gavin. It would be interesting to see how current model runs fare in comparison to the OHC observational data too (including to greater depths). For the non-scientist, Can you explain the blue-dotted line in the graph and the thin black line/ I assume those are overall global temperature. Thanks for the website. I work on climate change policy for a local government and your website allows me to keep up with the science conversation (as much as I understand it). Gavin, I can see the updated note under the graphs but the ‘correct’ and ‘incorrect’ graphs look identical. I thought the purpose of this post was to point out an error/ discuss changes in graphs yet you placed a new graph in the post which show “the basic picture unchanged”. I hope everyone here actually clicks on the link to the Jan2010 OHC graph and then clicks on the ‘incorrect’ graph to see the difference. I wish you had put those two graphs in this post. It would have been more informative. I do appreciate your quick response. You say that new post 2003 model runs will show heat content based on updated forcings. It seems to me the rate of heat uptake should depend mainly on the ocean surface temperature trend, not the applied forcing, per se. I mean, if you could accurately know the next 20 years of ocean surface temperature trend, it ought to be possible to make a very accurate prediction of OHC trajectory over that period, independent of what forcing would lead to that temperature trend. Which makes me think that you are hinting the updated forcings (rising aerosol influence) will lead to a lower trend in the modeled ocean surface temperature post 2003. Is that right? When will the post 2003 model trend be released? If i understand it well, the discrepency between models and observations is about 10^23 J ? Thanks for your answer Gavin. It seems that when it agrees it’s “the models”, and when it doesn’t it’s just “a model”. Anyway, what do other models give for 2010 values then ? Because here the value I read it 10^23 J, and it’s a lot (4 times the CO2 radiative forcing). Ok for Domingues, they seem more in line. What is your 5.1 in “5.1 x 365 x 3600 x 24 x 10-8”. Is it Stefan constant corrected for emissivity ? Thanks for the update and correction, Gavin; the OHC graphs have been a source of conversation in the past. Could you extend the ensemble mean as you did with the previous versions? Or is there a reason why you haven’t? Gavin – Please (you or Jim) update Jim’s diagnosed value of observed upper ocean heat storage in Watts per meter squared that he presented in this communication – http://pielkeclimatesci.files.wordpress.com/2009/09/1116592hansen.pdf. Gavin, one of things I tell non-scientists to watch for in distinguishing real science from fake scepticism is that real scientists make mistakes and are happy to correct them; fake sceptics stick to an argument no matter how many holes are knocked in it. What I like about this site is that no matter what you argue, the science is the ultimate decider. Denial blogs are tediously full of people who will argue any point, no matter how absurd, and only attack positions that disagree with their prejudice. Is it right that the “reality”-graph for the deep ocean does not show the anomaly wrt. 1975-1989? Rather it should be shifted upwards by the (unknown) heat uptake between 700 and 2000 m from 1975-1989 to 2005 (according to the GISS-ER-model by about 4*10²² J). Why just to 700m? The infamous “tritium experiment” clearly showed mixing to >1200m within a few years. Figure 1 in Cai et al. 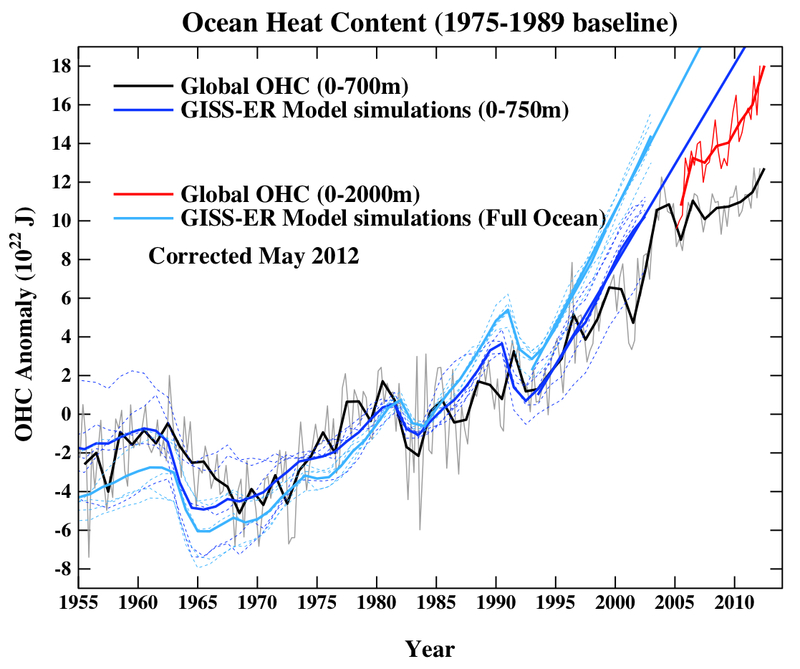 2010 seems to suggest that the vertical profile of ocean heat trends in the GISS ER and EH historical model runs is somewhat different than in most other models. Is there any clear reason for this difference in shape? One thing confuses me about this figure though, which leads me to think I might be misinterpreting it: the comparison with observations seems to suggest there has been significantly more ocean warming below 100m in reality. Yet your own plots suggest pretty good quantitative agreement down to 700m and 2000m, probably even an overestimate compared to observations. Gavin, in the Feb 2012 post, the graphs shown in the post and linked to as the original are identical. Comparison with other graphs shows that the graph currently displayed in the post is still the original. Gavin, Satellite measurements (eg CERES) of absolute TOA imbalance are poor to useless but month on month and year on year precision is good (ie the deltas). The jumps in the OHC charts published 1993-2009 (Trenberth 2010) and Lyman composite show OHC gains 2001-03 of about 7E22 Joules (700E20 Joules) which is a rate of about 350E20 Joules/yr. Trenberth’s 0.9W/sq.m TOA imbalance equates to 145E20 Joules/yr. To get a 350E20 Joules/yr increase in OHC, the TOA imbalance must have leapt from 0.9 to 2.4W/sq.m in the period 2001-03. The period coincides with the XBT to Argo transition, so which is right? – high precision delta measurement by established satellites or XBT-Argo in transition?? I would plug for the precision of the Satellites. The conclusion is that the step jumps in OHC Charts in this period are an artifact of the transition, and the greater deployment of Argo shows much flatter OHC since ARO 2003. The OHC data before Argo could be considered poor in spatial coverage and unreliable. Drawing a linear trend line through a step jump which is likely wrong is mistaken. The NODC data on the above chart shows a growth in 0-700m OHC of no more than about 3E22 Joules over a 8-9 year period 2003-2012 which is about 35E20 Joules/yr or equivalent of 0.25W/sq.m. This is a long way short of Trenberth’s 0.9W/sq.m TOA imbalance and Hansen’s 0.6W/sq.m. Gavin, I refer you to ‘Tracking the Earth’s Energy – From El Nino to Global Warming’ Trenberth & Fasullo NCAR 15MAY11. Fig 3 shows the net radiation from TOA from CERES EBAF Ed2.5 from 2000-2010. The value of Rt is the net imbalance at TOA. This is presumably a ‘direct’ measurement which fluctuates at or below the 1W/sq.m for most of the period. It actually drops well below 1W/sq.m for the 2001-2003 period. In the same 2001-03 period your above NODC chart for the 0-700m is step jumping about 7E22 Joules across this XBT-Argo transition period (a rate of about 2.4W/sq.m). Both cannot be right if 90% of this TOA heat imbalance is being sequestered into global OHC. How do you get a sharp increase in OHC in sync with a decrease in TOA imbalance? — considering the uncertainties, you can’t assume (as you continue to do) that the published numbers are accurate and precise, and then based on that assume that the exact wiggles you focus on must mean energy is being stored somewhere. You’re presuming a physical explanation exists for the wiggles. The short term wiggles are mostly noise and uncertainty. Just FWIW, RP Sr’s post today is wrong on both counts. The trend in the historical runs (1951-1999) was 0.15 x 10^22 J/yr, not the trend in the control runs. And point 2 is expanded on in comment #18. Gavin, your inline comment to my #18 above does not contain any specifics. I am quoting a large discrepancy in the NODC 0-700m OHC increase with regard to the 2001-03 period and the satellite numbers which actually show a decrease. Ice melt (sea and land), land + atmosphere ALL account for about 10% of the heat energy absorbed from the TOA imbalance. You agree that 90% goes into the oceans. By the way your point: ” And so TOA imbalances are equal to the integrated heat content change of the whole system.” should be “And so *integrated* TOA imbalances are equal to the heat content change of the whole system”. The evidence of this large OHC discrepancy in the 2001-2003 period when XBT and other methods were transitioned to Argo points to the ‘step jump’ being an artifact of the transition. The much flatter OHC increase in the last 7-8 years of Argo also points to better measurement giving lower TOA imbalance (ARO 0.25W/sq.m) which is a big difference from 0.9W/sq.m (0.85 rounded) and even Hansen’s 0.6W/sq.m is a significant difference from the 0.9 number. If the ‘step jump’ was brought back even to the 0.9W/sq.m number over that 2001-03 period, then the OHC increase would have been 2.9E22 Joules not ARO 7E22 Joules and the 0-700 NODC OHC would drop from ARO 12E22 to 8E22 Joules which is a very significant difference. Thanks for the update. Sad to see that Roger Pielke Sr. seems more interested in scoring points than getting the science right. SkepticalScience has a great post on the OHC issue. It is unfortunate that Roger Pielke Sr. is only to happy to throw stones from afar from a blog that does not permit comments. Roger is also only too happy to highlight other people’s errors and advising various people to update their sites. It is thus ironic that Roger has still not updated his own error made in this June,14 post on his blog, where it still incorrectly states (to this day) that the oceans accumulated accumulated zero Joules of energy between 2003 and May 2011. He has been aware of that error since at least October 1, 2011 when Dana brought it to his attention. More of Pielke’s errors are highlighted in the first SkepticalScience post linked to above– but I doubt he will fix them given that he has thus far failed to update his 2011 post. It is bad enough that Pielke Sr. is misleading reader’s of his blog, but that he seems to have no problem with misleading school students is especially egregious. Gavin, thank you for considering my points. I would have thought that consistency between data streams was essential to building a case. If you agree that the satellites (CERES and others) were showing decreases in TOA imbalance when OHC was sharply increasing, this must make one or the other data stream incorrect. Which is it? The OHC chart or the satellites? What you have expressed is that the Forcing (TOA imbalance) = differential of heat content change wrt time. Conversely the integral of TOA imbalance wrt time = change in heat content – which is what I said above. The 0.9W/M2 I refer to is that consistently maintained by Dr Trenberth. The 0.6W/M2 (2005-2011 period) I refer to is that reduced value argued by Jim Hansen & von Schuckmann in “Earth’s Energy Imbalance and Implications” – December 2011 final publication. Trenberth does not believe Hansen’s argument that Asian aerosols are mainly causing this TOA imbalance reduction ‘for a minute’ – see skeptical science discussion on this point. Trenberth argues that the missing heat is still missing – probably in the deep oceans and that Hansen is wrong because the Asian aerosols are already taken account of and the TOA imbalance is still 0.9. Hansen accepts that it never arrived in the first place in the 2005-11 period. I would have thought a major difference in opinion between two on the world’s leading climate scientists. Gavin, thanks for the detailed reply. As has been noted, I have been traveling, and I have quickly gone through the 67 comments. A few responses follow. There seems to be some confusion over Fig. 3. This represents the total net radiation from CERES EBAF and so it does include effects of clouds. It is not just the clear sky component (that is a lot more uncertain). Ironically the working definition of “clear sky” used in the community excludes clouds but includes aerosol. Since aerosols affect clouds (the indirect effect), I find this rather unsatisfactory. Still it does not affect things here. Dr Trenberth is clearly saying that the imbalance (presumably ARO 0.9W/sq.m) “include all of the aerosol effects, and so they are not extra”. There is discussion in the comments of the supposed finding that increasing aerosol (pollution) from China may be the explanation for the stasis in surface temperatures and I do not believe this for a moment. Similarly, Jim Hansen has discussed the role of aerosol as a source of discrepancy. However, the radiation measurements at the top of the atmosphere from satellites (CERES) include all of the aerosol effects, and so they are not extra. They may well be an important ingredient regionally, and I have no doubt they are, but globally they are not the explanation. How did the imbalance occur (comment 2) can be seen from Fig 3 broken into ASR and OLR (not shown here). ASR increased, suggesting fewer clouds as occurs in La Nina over the tropical Pacific, but OLR decreased. The latter seems to be mainly a temperature signal: colder conditions mean less radiation to space. This is often a complex relationship because the biggest variations occur in the Tropics and there is typically a large offset in OLR and ASR signals in association with variations in convection that largely relate to albedo effects being offset by the radiation to space from tops of clouds. Thus fewer clouds means more ASR and more OLR (since the radiation to space comes from warmer lower levels). But that works only in the tropics. At higher latitudes OLR is dominated by surface temperature effects. Comment 17 asks about “back radiation” which is really “downwelling radiation” that is the downward component emitted from the atmosphere in all directions. Clouds, water vapor, and all the greenhouse gases play a key role and the emissions correspond to the temperature of the air. For clouds, the key temperatures are the cloud top temperature for emissions to space and the cloud bottom temperature for emissions back toward the surface. An important point is that to understand the energy flows (which include radiation), the full three (or really four) dimensional structure of the atmosphere is needed, and the simple Figure 1 does not show the vertical structure of temperature. In response to 26: yes melting permafrost can take up some energy but the amount turns out to be very tiny. The last topic I’ll touch on is the ocean heat content (OHC). A couple of references were made to the von Schuckmann and Traon paper, which was nice to see, but has some flaws. For instance the data down to 2000 m in the ocean have increased since 2002 and since the beginning of that analysis, yet their error bars are constant. New analyses will be of considerable interest and are underway. ENSO involves a redistribution of OHC and losses to the atmosphere in the latter part of El Nino, and gains during La Nina, so this is internal to the climate system, not external (comment 31). The southern ocean is clearly playing a role (comments 48, 49)in taking up heat and mixing it deep, even though the magnitude of the observed warming is small. But the data are fragmentary and unsatisfactory in many respects. Nonetheless, the southern oceans, while playing some role, are not the main place where the heat goes in our model. We have a paper submitted that describes and documents that in more detail so it is premature to go into detail here. A nice paper is in press in GRL by Palmer et al (UKMO) using two Hadley climate models that details the relationship between SST and OHC to different levels in their model. Going all the way to the bottom accounts for all of the OHC but the upper OHC in the top 300 m and the SST (which relates to that) are not always good indicators of total OHC. So they also find that energy can go missing into the deeper ocean, and moreover the main phenomenon in their model associated with this is La Nina. [This latter point is not in their article]. The bottom line is that the ocean plays a major role in climate and especially in interannual and decadal variability, and a lot more will be written on this topic. Maintaining an adequate observing system is extremely important. Trenberth seems to have the number of 0.9W/sq.m with error bars fom Refs 6&7. Note from Fig 4 he reconciles the AR4 Radiative Forcings of +1.6W/sq.m to +0.9W/sq.m with a Radiative cooling term of -2.8W/sq.m and a WV + IA feedback of +2.1W/sq.m . Was this all taken from the Hansen 2005 paper? Another thing on errors and corrections. In 2010, the AMSU-A near-surface temperature data was looking like a real outlier, making 2010 a much warmer year than any other on the record (GISTEMP has it as warmest but not significantly; HadCRUT as a little below the warmest). I had another look at the site recently and it now reports that channel 4 (near surface) went bad in 2008. OK good, an error was corrected. When I dug a bit deeper, it seems that channel 4 was known to be bad (if my HTML anchor doesn’t work, scroll down to the heading “Yet Another Update”) since March 2008 – i.e., this wasn’t an error only picked up 2 years later by checking the data. Everyone can make mistakes, as we see in Gavin’s article. But what I wonder why this other blunder wasn’t all over the blogosphere. Or are some people allowed to make mistakes without causing offence to the sort of people (Roy Spencer was one of the authors of the AMSU-A temperature site) who demand absolute perfection in other circumstances? Gavin, I have a number of questions from your responses to my #25 and #28. Dr Trenberth in his part 3 discussion of modelling suggests that ‘the implication is that the missing heat is being deposited mainly in the region below 700m depth’. Dr Trenberth is clearly referring to Hansen’s point that the ‘imbalance’ has reduced due to Chinese aerosols (presumably reflecting heat out to space): Dr Trenberth suggests that this might happen regionally but not globally presumably because the CERES measurements are not showing a reduction in the 2005-2011 period. Have a look at Rt for the period in Fig 3 of same paper. Hansen plugs for a reduced imbalance from lower OHC measurement and Trenberth is for unreduced imbalance with the discrepancy being missing ocean heat hidden below 700m. That is a significant difference. I have a problem with the whole issue of how the CERES raw readings are corrected. I have seen +6.4W/sq.m as the raw imbalance and you have quoted +5W/sq.m which is corrected down to ARO 0.9W/sq.m. This correction is huge, and it is done to match the models ie. say +5/sq.m has a -4.1W/sq.m correction applied down to 0.9W/sq.m? You say “The fact of an imbalance is therefore much more robust than the exact magnitude”. With such a large correction (80-90% of the raw number) – how sure are we that the imbalance is even positive from CERES? If the imbalance is closer to 0.25W/sq.m in the post Argo period then the correction would be 95% of the raw number. CERES is probably good for monitoring changes in the TOA radiation not any absolute value. I notice that SORCE has a -4.5W/sq.m TSI discrepancy (it measures 1361.5W/sq.m when other satellites measure 1366) since deployment in 2005, and last time I looked at the website there was no explanation for this difference. It would make a -1.1W/sq.m reduction in incoming solar radiation if it were right, which is a story similar to CERES – an arbitrary absolute correction is being applied which could be right or wrong, so only difference measurements are useful. Does this mean that the SORCE number of 1361 W/sq.m at solar minimum should be adopted rather than the mean value 1366 W/sq.m so far widely used? If so that would give a new mean value of 1361.5 W/sq.m (about 1 W/sq.m max to min) and an Incoming Solar Radiation number of 340.4 W/sq.m. Dr Trenberth’s 15MAY11 paper quoted at #30 shows the Fig 1 “Global Energy Flows” diagram with an incoming Solar Radiation of 341.3 W/sq.m with Refected Solar Radiation at 101.9 and LW outgoing at 238.5. The sum of 341.3 – (101.9 + 238.5) = 0.9 W/sq.m – our oft quoted imbalance number. If the Incoming Solar number was reduced to 340.4 from 341.3 (coincidentally a drop of 0.9 W/sq.m) then the imbalance would be zero if the Reflected term and the outgoing LW values remained the same. This is remarkably close to my number of 0.25 W/sq.m at #17 from the last 7-8 years of OHC data. Again trying to construct a positive imbalance of 0.9 or 0.6 or 0.25 from differences in numbers of magnitude 340 needs an accuracy of better than 1 in 340 which is quite unrealistic in the context of the wide error bars of some of the forcing components – particularly aerosol effects and feedbacks. Very accurate ocean heat content has to be the key to quantifying the imbalance. I note that you have not commented on my calculation which keeps the reflected term at the same fraction (29.85%) of the incoming solar radiation. It seems logical to suggest that if the current Energy flow chart is budgeted around an imbalance number of +0.9W/sq.m then the ratios of incoming to reflected to achieve that budget would hold same if the absolute value of the incoming was refined to a more accutate figure (TSI of 1361.5) – ISR of 340.4W/sq.m. Maybe it is time to ask Kevin Trenberth what he will make of the chart with a TSI of 1361.5 instead of 1366.